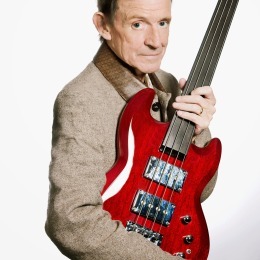 Many people were saddened by the recent death of Jack Bruce. Bassists in particular have reason to acknowledge his influence and his passing. I certainly do. As a young man and beginning bassist in London in the 1960s I had opportunities to hear many fine players, both of double bass and electric bass. Ron Mathewson, Chris Laurence, Dave Green, Danny Thompson, Jeff Clyne and Harry Miller were among my favourite jazzers. They were readily ‘available’ at club gigs around London. Listening to Jazz Club on the radio I grew to identify some players by their sound alone, because in those days bass amplification had yet to arrive. (When it did, for a while everyone sounded like ‘Mr. Polytone’ or ‘Mr. Underwood’, or whoever made the next pick-up.) And this was without all the great American players I was also into. On electric bass there were some fine players too – Alex Dmochowski swung like no other beside the drummer Aynsley Dunbar, but Steve York, John McVie and Cliff Barton also come to mind. In the midst of this, in 1966 Cream arrived and exploded my sense of everything that might be possible. This configuration of genuine musical equals challenged the hierarchy implicit within many rock and jazz groups. The openness and symmetry of their power-house sound seemed perfect, while their playing was so free and adventurous, nothing was beyond their musical reach. They seemed well able to justify the egotistical band name and the ‘first supergroup’ tag. ‘Fresh Cream’ was constantly on the turntable at home and at parties, with its audacious writing, use of voices as instruments, and dispensing with the bass on occasions to allow Jack to play harmonica. (Play it? – he used it as a means of assault.) Rhythmically rock-solid yet fluid and innovative, blues-infused without being limited in form, lyrically inventive and intelligent, the album had so much, and it promised more. At the Saville Theatre show in February 1967 that ‘more’ presented itself in its full live glory, and at the bottom of it all was Jack’s bass with ‘that’ sound. In his hands it spoke, it sang, it growled; it drove, it probed, it challenged; it said restlessness, and conviction, and ‘why not?’ Above all it rejoiced in itself without regard for previous ideas of what the role of the bass ‘should’ be. And yet I would misrepresent Jack’s impact to portray it solely in terms of his bass-playing, when other aspects of his musicianship also broke the mould. His voice, so strong and clear, equally at home in the blues or some esoteric tune of his own, was highly distinctive and arresting. It made me want to hear the words, which was good because his song-writing, especially in collaboration with the poet Pete Brown, was both lyrically and musically exploratory and thematically rich. His sonorous cello and acoustic guitar tellingly invoking Indian music on ‘As you Said’; his ferocious harmonica playing; his contribution on double bass to Neil Ardley’s seminal album Dejeuner Sur L’Herbe with the New Jazz Orchestra; all these spoke of Jack as a truly creative artist who was alive to ideas and engaged on many fronts, so much more than a sum of his parts. I saw Cream once more at The Saville, and then was at the Albert Hall for the farewell concert. It was all so intense, and so short-lived. Jack went on to some fine and interesting projects: his solo album Songs For A Tailor was another mould-breaker, and he collaborated with Carla Bley the great American jazz innovator, among others. When he played with other guitarists such as John McLaughlin and Frank Zappa it seemed as if they were measuring themselves against the intensity and spontaneity of Cream, wanting their ‘Bruce badge’ as it were. Unsurprisingly, in my opinion, they always fell short. I doubt that Jack was the type for looking backwards, but I imagine it was hard for him to shrug off entirely the sense that Cream had ended too soon. He must have re-visited those tunes many times. I saw him in Birmingham in the early 1990s with a good band, playing Cream numbers among other songs, and he visibly relished them then. How I came to miss the Cream re-union at the Albert Hall I’ll never know. Jack was due to appear at the Spa Centre in Leamington in 2013 but the show was cancelled. Here is As you Said, a track that for me recalls much of Jack’s musicianship and creativity. Thank you Roger. It’s good to acknowledge those who contributed so much to the evolution of music though the mysterious role of the bass.